LE-200PS is a lightweight communication protocol analyzer has a Data Logger function to record data in the SD card for long hours. It is a high performance model, which covers all functions on LE-150P/150PS and supports multi protocols. Two Types of Operations Based on Usage Situation. 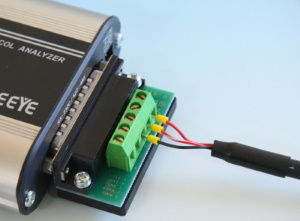 This device can be used as a PC-connectable Protocol Analyzer for use in the lab (Remote mode), and also as a PC-less Data Logger for use a ton-site tests to record data for long hours (Logger mode). The device comes standard with RS-232C/RS-422/RS-485 interfaces, which are used widely in medical equipment and electronic products. RS-232C interface supports 11 lines including control lines and Sync transmission/reception clocks, and it is able to operate the control lines automatically at Simulation function. RS-422/485 interface is able to control the driver automatically at Simulation function. * For attaching the optional DIN rail plate. Pitch: 70mm. Depth: 3.5mm (max). *1: A terminal-supplied power from analyzer. ON/OFF switchable. *2: LE-5TB is useful for connecting the signals. Do not allocate power supply of more than 6V to its 9/10/11/15/13/18/19 pin on the Dsub 25pin connector. It may cause the product malfunction. Supprts TTL level communication with an option. With an optional TTL probe pod (OP-5M), it can monitor TTL-level communication at 2.5V/ 3.3V/ 5V. It is useful such as when measuring TTL signals on an UART port of PCB and communication units. Supports not only Async/PPP communications but also Character Sync (SYNC, BSC) and Bit Sync (HDLC, SDLC). It is possible to select bit transmission order, polarity, and data format (NRX/NRX) and able to analyze efficiently. It can judge parity error, framing error, BCC error of various block check codes, and short SDLC/HDLC frame. It can find the communication sequence in the event of an error, by setting an application-level error notification character string to the character string agreement criteria of the triggering function. It can notify an error to external devices and alert a communication error in the logger mode (with a panel LED lighting), by specifying an external trigger signal output and user-defined LED lighting as a triggering action. In this setting, if finding an error, "1" will be added in the "Conter1". Details of counters can be checked by selecting Timer/Counter window. And, the value of counter can be another trigger condition. In this setting, if finding data of "41h, 42h, 43h, 15h", LED of U1 will be lighted. It is useful to check the flowing of specific data on the line without stopping the measurement. Indicate that analyzer is measuring or accessing to the SD card. Indicate the status of SD line (green light) and RD line (red light). Able to light the U1 (green) /U2 (red) by trigger actions. *: In the case of full-duplex transmission of 1Kbyte data at 1ms interval. Measured data is saved as log files of the specified file size in the HDD of the PC (Remote mode) or in the SD card of the analyzer (Logger mode). It automatically records data until reaching the specified number of files, and then deletes the oldest file to record the new file. Also, it can stop measurement on reaching the specified number of files. It is useful for detecting any hindrance in the line. Monitor data at any speed by setting the baud rate of any four digits. The high-precision timer makes it possible to record idle time and time stamps along with data, and is not related to the performance of the PC. It incorporates an easy-to-use simulation function that makes it possible to transmit preset transmission data (16 types of data), or fixed data such as FOX messages, at the flip of a key while checking reception data. Real Time Clock (RTC) backed up by the battery of the analyzer makes it possible to specify the starting and ending times of the measurement. After the measurement, it turns off the power automatically and saves on power consumption. Measure while the factory runs operation from 9:00 to 17:30. LED of LE-200PS will start blinking at 8:59 and be ready for measurement. It will start measuring at 9:00 and record data in the SD card for 450 files (4M each) as a ring buffer. It will stop measuring at 17:30 and turn off the power automatically to save on power consumption. * LE-200PS will start measuring from the next day if configuration is set after 9:01. To start measuring soon after the configuration, select the "Power On Run". * If the trigger action (stop measurement) is satisfied, LE-200PS turns off the power automatically to save on power consumption. Equipment communicates with other equipment while it receives power from a power supply randomly. In this care, it is necessary to prove power to the LE-200PS from the same power supply for the equipment. Safety start will start measuring approximately 40 seconds (LED will be blinking) after powering on the analyzer for charging the capacitor for back-up data. Communication logs will be saved in the SD card for 500 files (1M each) endlessly. LE-200PS will stop measuring when the power is not supplied for more than 1 second after saving data in the SD card. * To record data soon after the power is supplied, select "Quick Start". However, it is possible that SD card will be damaged from power failure. Communication log files can be viewed in detail on a PC. It offers seamless operation that handles a single measurement log file even when all files are read collectively. The measured data can be converted into text or CSV format to use in a word processor and/or spreadsheet software. Control multiple analyzers by one PC software. 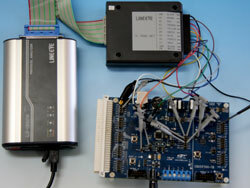 PC link software (LE-LINK20) included with the product controls multiple analyzers at the same time, and displays data in the separate measurement windows. A newly developed Instant Power Failure Prevention circuit with a Super Capacitor protects important communication log files stored in the SD cards. It protects data in case it occurs the power failure during recording to the SD card. Also, you can select the restart method of measurement from "Instant Start" or "After Charging Super Capacitor". Thus, continuous recording is possible while considering the status of data generation and power system. The palm-sized robust unit can be used between -10 to +55°C. It operates not only on USB bus power, but also on external DC power of 8 to 26.4V. The consumption current is as low as 100mA at DC12V input. The SD card slot and the USB connector are equipped with a dust-proof cover that allows 2-way operation. It can be fixed easily to the equipment to be examined or built into an inspection line, since it is compatible with 35mm DIN rails. The system language alternates automatically between English and Japanese according to that of OS. This facilitates introduction of the software to development bases outside Japan. Logger mode: External DC power (DC8-26.4V), AC adapter (6A-181WP09). Power consumption: 0.8W (Max.1.6W for about 10sec after turning on). DSUB 9pin monitor cable LE-259M1 DSUB 9pin. For RS-232C interface. TTL monitor probe pod OP-5M Probe pod unit to monitor TTL. Terminal Block Adapter LE-5TB Convert RS-422/485 port into terminal block. DIN Rail Mounting Plate LE-DIN13 To mount the analyzer on the 35mm DIN rail. Power Plug Cable SIH-2PG DC power to the DC jack of the analyzer. *1:It is available only for measuring RS-232C. *2:8GB SD card is included as a set of LE-200PS from April 2012. *2:8GB SDHC card is included as a set of LE-200PS from April 2012. *3:AC adapter is sold separately. In the Remote mode (with PC), it runs by the USB bus power. In the Logger mode (PC-less), you need to have the optional AC adapter (6A-181WP09) or use the optional Power Plug Cable (SIH-2PG) and external DC power.